I guess you all know that one of Katja’s and my biggest poker buddies is Sebastian Ruthenberg aka MiamiVice aka taktloss47 aka Luckbox, in short since some time only “lucky” for me. Sebastian is having a very good run over the last months and is incredible successfull in poker tournaments (he is a winning cash game player also). 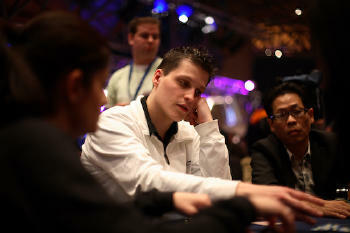 Even more impressive, he is successfull in both live and online tournaments. He won the Partypoker German Open in London last year, he got on both big events final tables last week in Bregenz (to name just a few) and now he is about to accomplish the biggest success of his young career: reachng the final table in the biggest EPT event in history, the EPT Dortmund with 494 players. My own fate in the EPT event was sealed when I made a big all-in reraise out of the big blind with A-Ks in level 5 of the tournament but Gunnar Rabe called me for all his chips with J-J and won (he is also still in the tournament so he made good use of my chips). I also played the 1,000 euro event but after losing twice with aces I got busted in level 6. On the positive side I played some online poker and made up for all my buyins (100/200 FL). In fact, I decided to use my weekend’s online winnings to buy myself into the EPT Monte Carlo event later in March, a 10,000 euro buyin tournament. I would go there anyway, accompany Katja and blogging so I think why not play? Katja was also not able to get anything rolling in the tournaments but she played some cashgames and scored nice winnings so the weekend is still Ok for us. Regarding Katja, you get to read “How the hell is she making any money?” across german boards from time to time as the has no relevant international tournament success yet. While I don’t want to get into details here let me just say that Katja is one of the best live cash game players I know (and I know quite many) and she picked up tournaments seriously only since like 18 month. If I would not have Katja I would be broke, that many times she saved our bankroll from my “swings” (which you might have read about here a lot). My favorite saying is “I try to lose less than Katja wins”. I do the big limits and scores (whenever possible 😉 but she gives us the financial “grounding” we need to survive in the poker world. If there are any real ‘professional players’, Katja is 100% one of them.